Discover the Networks | Donald Payne Jr. 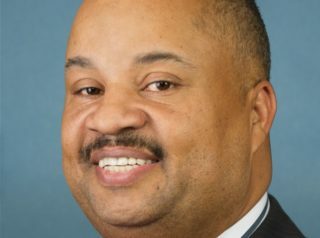 Son of the late Congressman Donald Payne Sr.
Donald Payne Jr. was born in Newark, New Jersey on December 17, 1958. After studying graphic arts at Kean University, he worked as director of student transportation at the Essex County (New Jersey) Educational Services Commission, and was employed for some time by the New Jersey Highway Authority. Payne was also a member of Essex County’s Board of Chosen Freeholders from 2005-12, an at-large representative of the Newark City Council from 2006-12, and the president of Newark’s Municipal Council from 2010-12. On November 6, 2012, he won a special election, as a Democrat, to fill the vacant U.S. House seat (representing New Jersey’s 10th Congressional District) that his late father, Donald Payne Sr., had occupied for the previous 23 years. Upon joining Congress, the younger Payne also became a member of the Congressional Black Caucus. Shortly after Congress had approved a $700 billion bailout of financial services firms in October 2008, Payne was one of six Democratic members of Congress who enjoyed a Caribbean junket sponsored by Citigroup in November. According to the National Legal and Policy Center, a watchdog group, the trip violated House rules: “The ‘lead sponsor’ was Citigroup, which contributed $100,000. Citigroup was certainly aware that it would be a major recipient of bailout funds. It was also aware that its fortunes had become increasingly reliant on Congressional actions. Citigroup should have also been aware that corporate sponsorship of such an event was banned by House rules adopted on March 1, 2007, in response to the [lobbyist Jack] Abramoff scandal and the infamous golf trip to Scotland.” Joining Payne on the trip were Charles Rangel, Sheila Jackson-Lee, Carolyn Cheeks Kilpatrick, Bennie Thompson, and Donna Christensen. In early 2015, Payne objected strenuously when Republican House Speaker John Boehner—without first asking President Obama for his approval—invited Israeli Prime Minister Benjamin Netanyahu to speak to Congress about the gravity of the growing Iranian nuclear threat and his strong opposition to the negotiated deal that the Obama Administration was pursuing with Iran. Charging that “Speaker Boehner’s unilateral invitation to Prime Minister Netanyahu was a breach of protocol” that “undermine[d]” U.S.-Israeli relations by “bringing partisan politics into the mix,” Payne decided to boycott Netanyahu’s speech. In December 2015 Payne introduced the Safe Neighborhoods Gun Buyback Act, designed to authorize $360 million in funding for gun buybacks. Under the provisions of this legislation, gun owners could turn over their firearms to state and local governments or to certain gun dealers, which in turn would pay them 25 percent more than the market value of those weapons. an ever-increasing reliance on “green energy” sources such as wind and solar, along with a phasing out of fossil fuels, the imposition of carbon taxes, and the raising of vehicle CAFE standards. For an overview of Payne’s voting record on an array of key issues during his years in Congress, click here. Further Reading: “Donald Payne Jr.” (Votesmart.org, Keywiki.org); “Rangel, Other Reps, Party in Caribbean With Citi Funds” (Newsmax.com, 1-30-2009); “Payne Deeply Disappointed in Ferguson Grand Jury Decision” (11-25-2014); “Payne Statement on Netanyahu Speech to Congress” (3-2-2015); “House Democrats Introduce National Gun Buybacks” (Breitbart.com, 12-17-2015); Donald Payne Jr.’s Positions on Key Issues (OnTheIssues.org).